Many PC gamers are probably focused on scoring a Cyber Monday deal on the latest software titles, but now would be an equally opportune time to boot up a Nvidia Shield and install its latest update. Nvidia has announced the release of its December Software Update, delivering improvements to 720p, 60 FPS Console Mode in addition to official support for a number of new games. 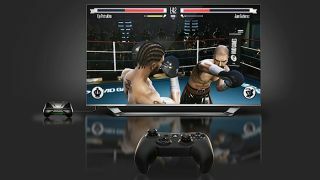 An even more enticing reason to install this month's update is the launch of 1080p, 60 FPS PC Gaming Console Mode, which promises to deliver the "ultimate level of image quality" for PC games. The lineup of games with 1080p support includes Assassin's Creed IV: Black Flag, Batman: Arkham Origins, Battlefield 4, BioShock Infinite, Borderlands 2, Crysis 3, and The Elder Scrolls V: Skyrim. Additional titles will be enabled on a weekly basis. Although 1080p game support would be enough to satisfy a good number of PC gamers, Nvidia is taking things a bit further with its December update, adding a few new tricks to the Gamepad Mapper functionality introduced in October. Gamepad Mapper allows Shield players to remap touchscreen-based game functionality to physical buttons on hardware-based controllers, and the latest update extends the feature to gyroscope and motion-based movements as well. Fans of titles such as Mass Effect Infiltrator should be pleased to discover this month's update enables a new analog stick function, letting players move with the left thumbstick while using the right thumbstick to look around. Acknowledging that gamepad mapping can be time-consuming, Nvidia automatically downloads pre-created profiles for the most popular titles. It's also launched a new community profile beta feature for players to create and share their own profiles, even with their favorite Android games. Get your hands-on look at Nokia's first tablet in our Lumia 2520 review!